This entry was posted in Health & safety solutions on 2018/06/20 by Susan. Steep slope logging is a leading source of injuries in forestry. Industry has identified some best practices to better protect workers on this terrain. In 2017, a forestry worker died in Northern B.C. while using a feller buncher to cut timber on a steep slope. He was trapped inside the machine after it tipped over and caught fire. My heart goes out to the many people touched by this tragic loss. The logging done on steep slopes accounts for more than a quarter of all logs harvested in B.C., according to FPInnovations, creators of the Steep Slope Initiative. It’s also one of the leading sources of injuries and fatalities in forestry. Make sure to read the article for more details about each of these safety best practices. I contacted Budd to find out if there had been any updates since the article was published. One thing he mentioned was the new rescue tools manufacturers are putting on harvesting machines. People can use the tools to cut into the cab of a machine if it rolls over and someone is trapped inside. He also said WorkSafeBC is looking at revising Part 16: Mobile Equipment of the Occupational Health and Safety Regulation. 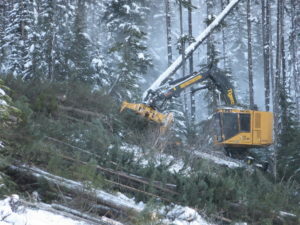 Please see my post Logging on steep slopes calls for new safety solutions for more information about the work of FPInnovations and the steep slope resource package from the BC Forest Safety Council.